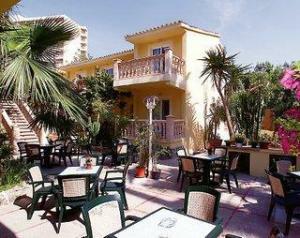 General Description: Cupidor Hotel in Paguera has 24 rooms and was renovated in 2010. The closest cities to the hotel are Camp De Mar (3 km), Santa Ponsa (5 km) and Puerto Andratx (7 km). To make your stay more comfortable air conditioning is available. The staff in this 1 storey hotel speaks German, Italian, Spanish and English. Mobility on holiday is simplified through bike rental. The hotel is within easy reach of shops, taxi stands, disco, tourist information, bars and restaurants, bus stops and supermarkets. Distance from the hotel to: horse riding (1 km) and airport PMI (25 km). For your entertainment the hotel features a TV lounge. Amenities: For convenience the following services are offered: medical care, room service, maid service, ironing service, laundry service and a safe. Internet access is provided in internet rooms. Reception hours: 08:00 - 23:00. Meals: The breakfast type is Buffet. Guests are welcome to enjoy their meals at the restaurant.